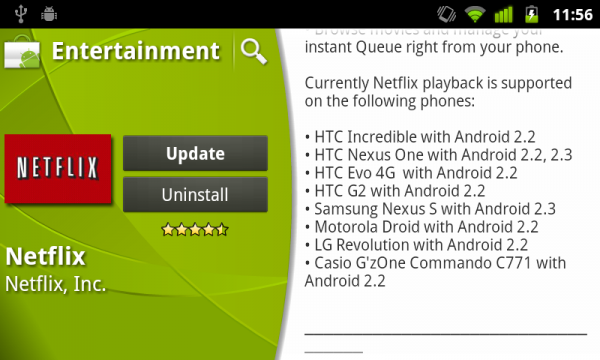 The Netflix app on Android just received an update and apparently supports our old friend, the Motorola DROID. That’s right, the OG is still getting love even after almost 2 years of life. There is a chance that it will only work if you are running Android 2.2, but feel free to try it on one of those 2.3 ROMs. We also received a report that it may no longer be working on rooted DROID Incredibles, but can’t 100% confirm that. Our Inc is running Gingerbread with root and definitely doesn’t work, but almost didn’t expect it to since the requirement is 2.2. Anyone else having issues with their rooted Inc after updating? Update: Our guy with issues is also running 2.3. Looks like that is the problem. We have confirmation from rooted 2.2 owners that are not experiencing issues and still enjoying their favorite movies and shows.